Izhaan looks straight into the camera with an expression that makes us drop everything and ogle back with love. Is it even called a Sunday if it’s not spent lazying on the couch, cuddling with your loved ones? 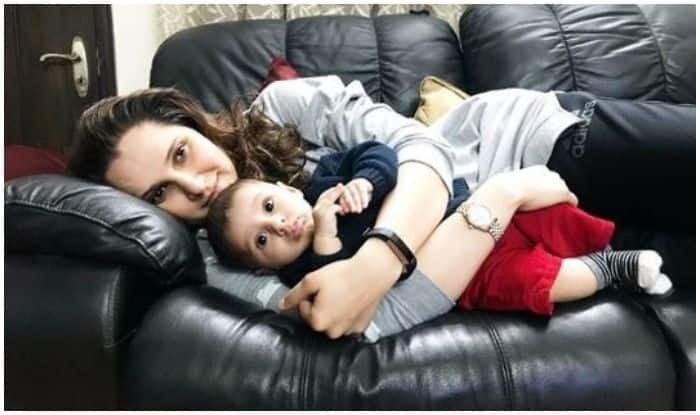 Indian tennis star Sania Mirza answers it for us by her recent Instagram post which features her cute little munchkin Izhaan. The frame, inevitably, drips with dollops of cuteness as the mother-son duo teach us to live the last day of the week, the right way up. In the shared picture, the gorgeous athletic mother is seen looking away from the camera as she lies on the couch with Izhaan who looks straight into the camera with an expression that makes us drop everything and ogle back with love. Sania can be seen donning a comfortable pair of black-coloured Adidas lower paired with a grey-coloured tee. With her brown tresses falling effortlessly on her shoulders in an elegant manner, Sania’s easy-breezy look is dented by a wristwatch worn on one hand and a fitness band on the other. Mumma’s boy Izhaan, on the other hand, donned a navy blue sweater teamed with red-coloured shorts and black and white stripped socks. Sharing the relaxing picture on her social media handle, Sania captioned it as, “Lazy boying with my lazy boy Ps- look who found the camera again #Sundaycuddles #Izhaan” (sic). Enjoying a huge fan following, Sania keeps updating fans who wait on the edge to get the latest insights about her life, both on and off the court. In just three hours, the said post garnered over 2 lakh, 24 thousand likes and is still breaking the internet.